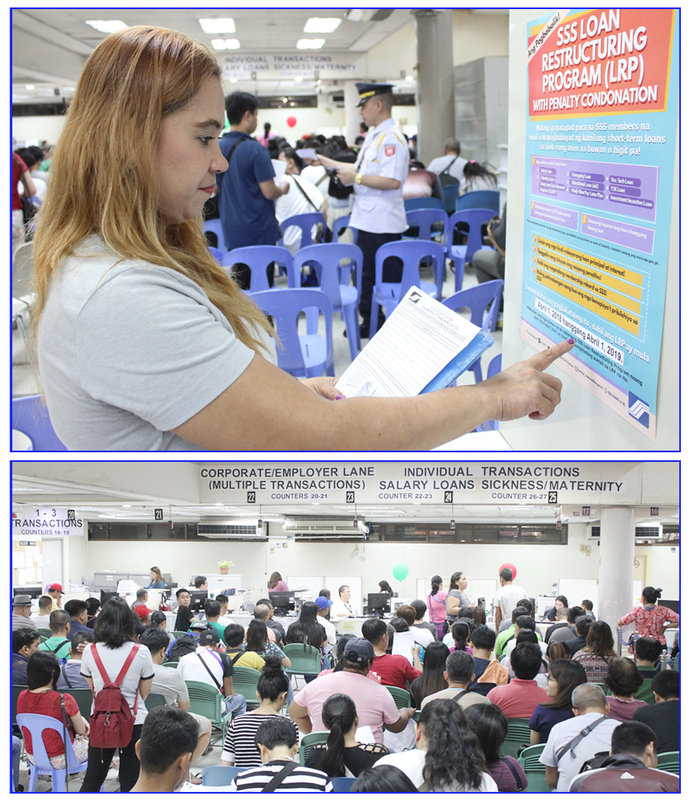 Bottom photo shows members in Diliman branch applying for LRP. SSS President and Chief Executive Officer Emmanuel F. Dooc previously said in a statement that SSS understands that there were untoward events like calamities that might have caused difficulty for loan repayments. Amid the announcement on the extension of the Loan Restructuring Program (LRP) with penalty condonation, members of the Social Security System (SSS) flocked to Diliman branch on its supposed deadline, October 1, to apply for the program. SSS President and Chief Executive Officer Emmanuel F. Dooc announced on September 28, that the LRP will be extended for another six months or until April 1, 2019, to accommodate more members applying for the LRP. Top photo shows Rizza Cruz, 40, who lined up at Diliman Branch Monday morning to inquire and apply for LRP on behalf of her OFW husband Rolando Cruz. The housewife from Cavite City felt relieved that she still has enough time to apply and pay for her husband’s salary loan obligation in installment. Members who cannot personally go to the branch can send their representative along with an authorization letter and valid IDs. SSS President and Chief Executive Officer Emmanuel F. Dooc said that on October 5, the SSS started offering calamity loan, advance three-month pension and direct house repair and improvement loan under the CAP for affected members. “SSS recognizes that a large number of members residing in Luzon area are currently struggling to recover from the devastation of Super Typhoon Ompong. That’s why we are always here to give them financial assistance in this way to help pay for their basic necessities and rebuild their houses,” Dooc said. Qualified members for calamity loan, advance three-month pension, and direct house repair and improvement loan are those with home address or property in calamity-stricken areas declared by the National Disaster Risk Reduction and Management Council (NDRRMC). NDRRMC-declared calamity areas are Abra, Apayao, Benguet, Ifugao, Kalinga, Mountain Province, Ilocos Norte, Ilocos Sur, La Union, Pangasinan, Batanes, Cagayan, Isabela, Nueva Vizcaya, Quirino, Aurora, Bataan, Bulacan, Nueva Ecija, Pampanga,Tarlac, and Zambales. Under the CAP, affected members can apply for calamity loans of up to P16,000 if they are paying contributions based on the maximum monthly salary credit (MSC). In addition, they should have at least 36 monthly contributions, six of which must be paid within the 12-month period preceding the date of application. .“The calamity loans are more affordable and has flexible payment terms, which are payable in two years in equal monthly installments with interest rate of 10 percent per annum, and one percent monthly penalty for late payments. We have also waived the one percent service fee to help reduce the applicant’s expenses,” Dooc said. Based on SSS data, more than 800,000 paying members were affected by Super Typhoon Ompong last September 14. Of the total members affected, the pension fund identified over 80,000 potential borrowers with an average monthly salary credit of P10,000. “OFW-members who reside within the declared calamity area are also qualified to avail of the calamity loan. They just have to issue an authorization letter to their representatives who will file the CAP applications on their behalf,” Dooc said. Dooc, however, reminded that those who are still paying their loan balance under the Loan Restructuring Program (LRP) and previous calamity loans, as well as those with final benefit claims, such as for total permanent disability and retirement, are not qualified under this assistance program for Ompong-affected members. Aside from calamity loan, members with damaged homes can also avail of the Direct House Repair and Improvement loan Program. It offers interest rate of only eight percent per annum for loan amount up to P450,000, and nine percent per annum for loan amount of P450,000 up to P1 million. The special loan program also has six month-moratorium in payment term and waived processing fee of one percent. To qualify for Direct House Repair and Improvement Loan, the member must not be more than 60 years old and with at least 24 monthly contributions, in which three contributions are paid within the last 12-month period prior to the month of filing. Meanwhile, pensioners affected by Super Typhoon Ompong have the privilege to get their three-month pension in advance. Applicants will only have to present a barangay certification as proof that they reside in an NDRRMC-declared calamity area. As of October, SSS has identified 263,346 potential pensioners in affected areas with an average monthly pension of P3,075.82 who may avail of the advance three-month pension. Filing of calamity loan and advance-three month pension applications is until January 4, 2019 while Direct House Repair and Improvement Loan application is until October 4, 2019. The pension fund is also offering Calamity Assistance Program to members affected by Southwest Monsoon enhanced by Typhoon Karding and massive flooding brought by the Southwest monsoon enhanced by Tropical Cyclones Henry, Inday, and Josie. Qualified applicants affected by Tropical Storm Karding can still apply for CAP and advance three-month pension until December 10, 2018 and Direct House Repair and Improvement Loan until September 10, 2019. Meanwhile, members affected by monsoon rains that were strengthened by three cyclones last July can still avail of CAP and advance three-month pension until November 12, 2018.